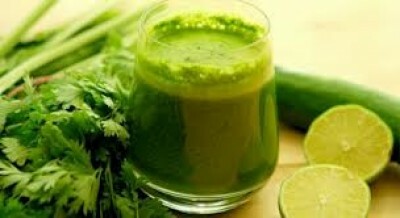 Put all the ingredients through your juicer and drink immediately. If its difficult for your jucier to jucie the kale you can put it in between the apples. If you do not have a juicer blend it all in a blender and strain it through a nut-milk bag. You might have to add some water to get the blades go round in the blender. You can get your Nut-Milk bag from a well stocked health food shop or try making one yourself. This way is my favorite way of making a juice. It is quick to make it and not much to wash up afterwards. And the juice is lovely and smooth without any bits inside it.